We went fishing and look what we caught!!! 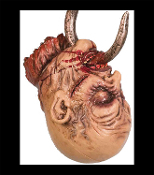 Metal-look faux meat hook, working painfully through this involuntarily dismembered cut-off severed undead zombie skull jaw, with hook end protruding from his decaying mouth. Startling! Realistic Latex deluxe foam-filled dead victim's head is sure to horrify unsuspecting visitors!